Do brain games really work? Or is this just another marketing ploy to sell expensive products and services? Finally, a Lumosity review that reveals the truth behind brain games.Warning – you make not like what you learn. We live in a time of information overload and while we have all types of gadgets that are aimed at speeding up our lives they also are forcing us to remember more than ever. And sometimes when our brains fail to move as fast as technology we get hard on ourselves. The truth is that we will all have a certain decline in our ability to remember things, to concentrate and focus – especially if we are comparing ourselves to a younger version of us. And that is what a lot of people do. Have you heard someone say “I don’t know what’s wrong with me I used to be able to remember so easily”. Well these are very common words and ones that you will definitely hear from an aging individual at some point in their lives. Aging and cognitive decline go hand-in-hand to some degree, but we do have the ability to have some control over this. We are able to train our brains just as we do our muscles in our body. And this is exactly what Lumosity claims – that they are training for the brain. But is this the right kind of training? Or is all brain training the same? Discover the truth in this Lumosity review. BBC conducted a study examining games such as Lumosity and Nintendo in order to determine whether or not they have proven long term effects on the brain. The test ran over a period of six weeks with 11, 430 participants. Their findings indicated that, “brain training games do not improve overall brain power”. This in addition to a number of other reputable magazines also concurred that such games do not have any type of cognitive benefit. This type of evidence goes against everything that we have been led to believe and most importantly the claims that Lumosity is making. So what’s the deal? Is Lumosity just a scam? Do brain games really work? Well the truth is that it depends on the type of games. Not all brain games have a cognitive benefit. However, there are those that have been scientifically proven to boost short term memory, problem solving, concentration, general intelligence and so on. These types of games are referred to as n-back. “The n-back training method is the only effective method in over 40 years of research…” claims this YouTube Lumosity review. Research studies have substantiated these claims thus any game that uses the n-back methodology therefore should improve memory. The most important part of this research was that in order to see benefit the participant would need to engage in such games for only 20-25 minutes a day for 20 days. So does Lumosity use n-back? Yes, they currently have 8 n-back games. 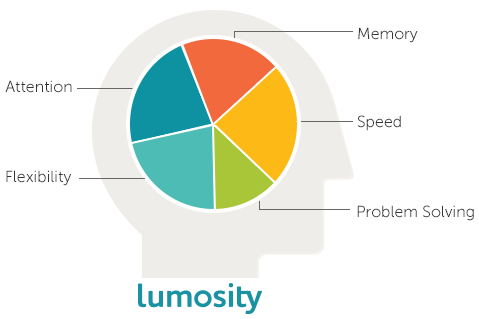 So What is Lumosity Anyway? The n-back training along with a host of others games is the premise of this online service. However, it is certainly not a one size fits all solution. Lumosity asks you the area that you want to focus on the most, be it concentration, memory, etc., and then it gears exercises that it thinks will benefit you the most. You are presented with a different assortment daily so that your mind is constantly challenged while working on different things. While Lumosity certainly stands behind its product you cannot negate the power of the marketing that has been put behind this product. Clearly, this is marketing at its best. They have been able to tap into a human need and use a number of brilliantly created marketing strategies to engage and lure customers of any age and demographic. All you have to do is watch 5 minutes of their commercials and you are hooked. You will hear things like, “I did it to be quicker”, “just to stay sharp”, “to remember people’s names”, “to concentrate a little better”, “to learn faster”, and so forth. Who wouldn’t want this? I can’t think of a single person that would not be thrilled to have any of these factors improved in their lives. While there are definitely countless blogs with their own Lumosity review spreading their raves we do need to keep things in perspective. What Lumosity has done is tap into a solution to a problem that most people would admit they have to some degree and want improvement on. Along with that they have spent an inordinate amount of money on fantastic marketing that most people can not resist. But the most important question according to this Lumosity review is whether or not this type of service actually works. And the clear verdict is that it does. Well partly! Or at least the n-back training games do. However, that is not to say that the other types of games they are using do not have any benefit. What we need is more research and they are doing just that. Through various collaborations Lumosity continues to work with researchers to find the best games possible to help people. At the end of the day it is a business and businesses are out for making money, but it seems that their mission and vision is genuine. So if you are looking for a little memory boost why not give their free option a trial. Watch the video below to get a sneak peek inside the Lumosity members area.